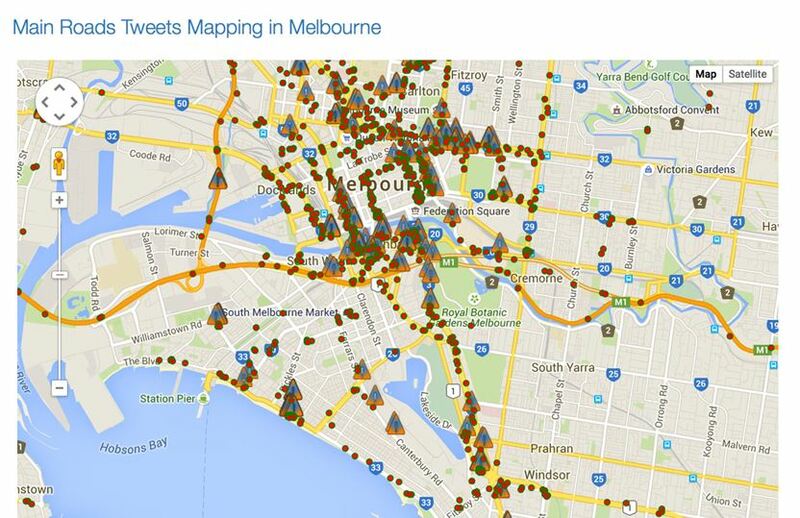 Can tweets from the streets improve traffic? A way to mine Twitter data to identify real-time traffic jams and accident black spots has been developed by University of Melbourne researchers. These ‘tweets from the streets’ could give urban planners the big data they need to make our transport systems more efficient, identify accident black spots and make our cities more liveable. “We have built a way to harvest Twitter data while people are on the roads. It’s a controversial idea, because people shouldn’t be tweeting while they’re driving,” says Richard Sinnott, Director of the Melbourne eResearch Group. Richard and his colleagues and students do their analysis using Australia’s road system data, available through the AURIN Portal. But for this research they’re not actually reading the tweets. “We’re not interested in what they’re tweeting about, whether it’s ‘I’m stuck in a traffic jam’ or ‘I had bacon and eggs for breakfast’,” Richard says. A typical 140 character tweet has nine kilobytes of data and metadata, such as your profile information, who you follow, who follows you, what language you’re tweeting in, what device you’re tweeting with and, if geolocation services are turned on, where you’re tweeting from. Richard says this data has huge potential. This entry was posted in Built Environment and Infrastructure, Latest News, Transport, Urban Development. Bookmark the permalink. Are we planning adequate healthcare for the coming ‘ageing boom’?